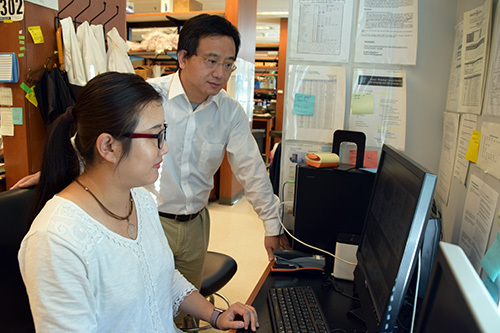 Co-authors Jun Fan, PhD, assistant professor of radiation oncology, and postdoctoral fellow Ruiting Lin, PhD. Arecoline -- the stimulant component of areca nuts -- has anticancer properties, researchers at Winship Cancer Institute of Emory University have discovered. The findings were published Thursday, November 17 in Molecular Cell. Areca nuts are chewed for their stimulant effects in many Asian countries, and evidence links the practice to the development of oral and esophageal cancer. Analogous to nicotine, arecoline was identified as an inhibitor of the enzyme ACAT1, which contributes to the metabolism-distorting Warburg effect in cancer cells. "This is just a proof of principle, showing that ACAT1 is a good anticancer target," Chen says. "We view arecoline as a lead to other compounds that could be more potent and selective." Chen says that arecoline could be compared to arsenic, a form of which is used as a treatment for acute promyelocytic leukemia, but is also linked to several types of cancer. Plus, arecoline's cancer-promoting effects may be limited if it is not delivered or absorbed orally, he says. When arecoline first arose in a chemical screen, Chen says: "It sounded like a carcinogen to me. But it all depends on the dose and how it is taken into the body." The co-first authors of the paper are Jun Fan, PhD, assistant professor of radiation oncology, and postdoctoral fellow Ruiting Lin, PhD. Co-authors at Winship include Taofeek Owonikoko, MD, Manila Gaddh, MD, Martha Arellano, MD, H. Jean Khoury, MD, Sumin Kang, PhD, Paul Doetsch, PhD, Sagar Lonial, MD and Walter Curran, MD. Chen's laboratory had previously identified the mitochondrial thiolase ACAT1 (acetyl-CoA acetyltransferase) as a control valve regulating the Warburg effect. In this paper, the researchers showed that ACAT1 enzymatic activity was higher in several types of cancer cells, even though the levels of ACAT1 protein are about the same. The reason is that the protein clusters together as tetramers in cancer cells. Tyrosine kinases, often on overdrive in cancer cells, "hijack" ACAT1 and nudge it into tetramers, which are enzymatically more active. Arecoline appears to do what the researchers proposed it would: it steers cells' metabolism away from glycolysis. The compound inhibited the growth of human lung cancer and leukemia cells both in culture and grafted into mice, and did not affect the growth of normal blood cells. Genetic mutations in ACAT1 lie behind a very rare metabolic disorder called beta-ketothiolase deficiency. Complete inhibition of ACAT1 could induce side effects resembling that disorder. But when the Winship team incompletely "knocked down" ACAT1 in cells using arecoline or genetic tools, the main effect was on protein acetylation, not on ketone metabolism, Chen says. While the researchers did not see obvious toxicity when treating mice with arecoline, more extensive pharmacokinetic and toxicology studies with arecoline and similar compounds are needed, he says. The research was supported by the National Cancer Institute (CA140515, CA183594, CA174786, CA175316, CA169937), the T.J. Martell Foundation, an American Cancer Society seed grant and the Georgia Cancer Coalition.